Helen Sawyer Hogg in her office at the David Dunlap Observatory. Courtesy of the Department of Astronomy and Astrophysics, University of Toronto. 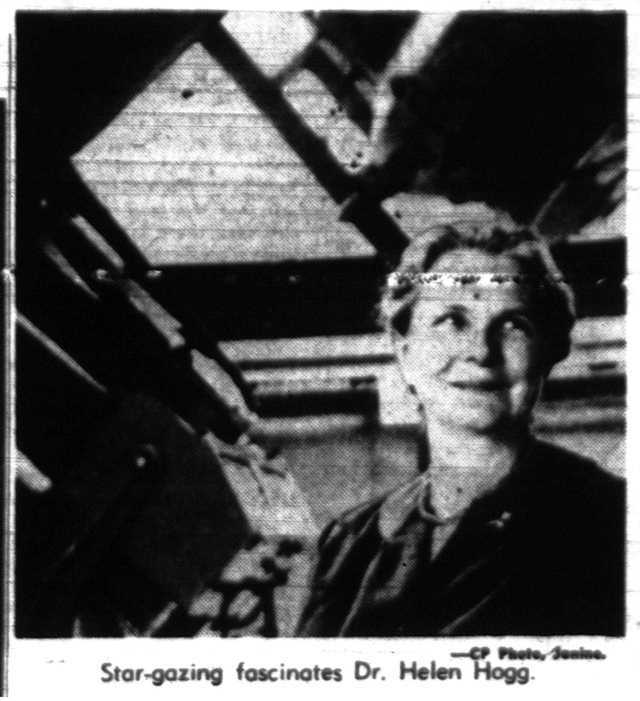 On April 30, 1935, the Toronto Star featured a profile of Dr. Helen Sawyer Hogg, a researcher at the new David Dunlap Observatory. Sawyer Hogg, the article explained, would be continuing her study of globular clusters, relatively dense collections of stars which she could now study using the Dunlap’s 74-inch telescope, the largest in the British Empire. Although only an unpaid researcher in 1935, Helen Sawyer Hogg would emerge as an internationally renowned astronomer, known for her detailed work on globular clusters and for promoting astronomy to the Canadian public. Helen Sawyer was born in Lowell, Massachusetts in 1905. After initially pursing a degree in Chemistry at Mounty Holyoke College, she became interested in astronomy following a junior-year class with Dr. Anne Sewell Young when Young took her class on a winter field trip to observe a solar eclipse. “It was magnificent,” she told the Star‘s Trish Crawford in 1985. “We stood in very deep snow in a golf links. Miss Young’s teaching switched me from Chemistry to Astronomy.” After completing her degree, Sawyer pursued graduate work at the Harvard Observatory, earning her PhD in Astronomy from Radcliffe College in 1931. While at Harvard she met and married a fellow astronomy graduate student, a Canadian named Frank Hogg who earned the first-ever Astronomy PhD awarded by Harvard. Once they had completed their degrees, the Hoggs moved to British Columbia, where Frank took a position at the Dominion Astrophysical Observatory. Although not formally employed by the Observatory, Sawyer Hogg began volunteering, building on her graduate work by photographing and describing globular clusters. 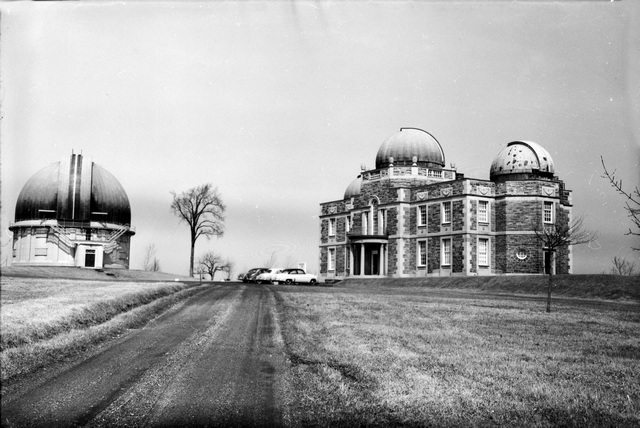 Shortly before the completion of the David Dunlap Observatory in 1935, the couple relocated to Toronto, where Frank took a lecturing position at the University of Toronto’s Department of Astronomy, eventually rising to become the Observatory’s director in 1946. The David Dunlap Observatory, 1935. Courtesy of Toronto Public Library. While being a woman may have initially limited some of Sawyer Hogg’s professional opportunities, she later claimed that she deliberately kept her early workload light, so she could attend to her three infant children. In the 1930s, Sawyer Hogg focussed primarily on research at the observatory, not assuming additional lecturing responsibilities until her children were older. Numerous sources report that Sawyer Hogg sometimes brought her daughter, Sally, to the observatory, and worked at the telescope while Sally slept in a basket. 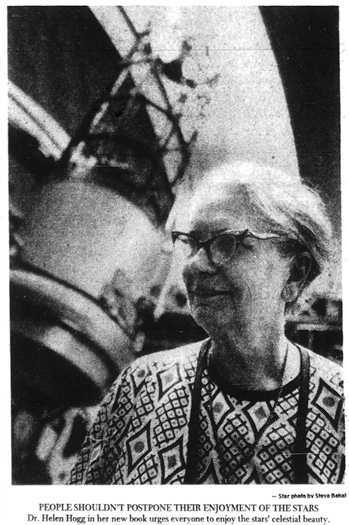 Sawyer Hogg photographed and catalogued these globular clusters over the next few decades, the Globe and Mail noting that she sometimes spent eight to 10 hours a night at the telescope, and that the work “calls for patience and hardihood, as the room is not heated.” Over her career, Sawyer Hogg published over 200 research papers, and frequently published catalogues of her globular cluster findings, credited with discovering hundreds of variable stars. 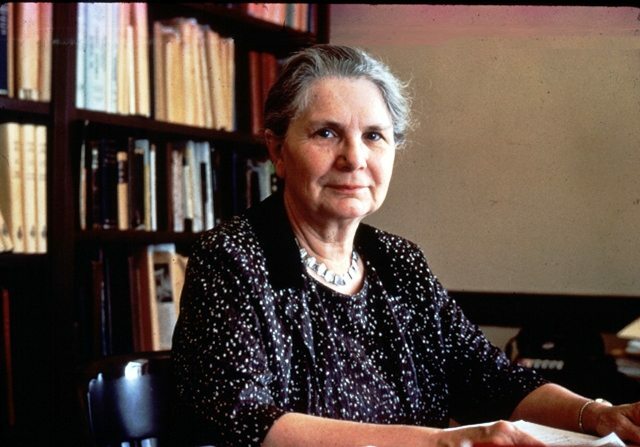 As her work continued, her role with the University of Toronto grew; she became a lecturer in 1941 and eventually worked her way up to full professor in 1957. The opening of the David Dunlap Observatory sparked a growing interest in astronomy in and around Toronto, and numerous Observatory staff made time for public education in addition to their academic research. In the late 1930s, the Toronto Star ran several astronomy-themed articles of a speculative nature, including a 1938 Gordon Sinclair piece, “Moon to Oust Muskoka As City’s Holiday Mecca?” In these years, the Star‘s regular astronomy consultant was Dr. Peter M. Millman, a Dunlap astronomer who eventually began writing regular astronomy articles for the Star in 1940. After Millman’s career was halted by the Second World War, the Star‘s astronomy column, now called “With the Stars,” was taken up by Frank Hogg, who wrote on a variety of astronomy topics until his death on January 1, 1951. Less than two weeks after Frank’s death, the Star announced that Sawyer Hogg would continue “With the Stars,” the editors proclaiming that “with an unimpeachable scientific background, she combines a sense of adventure and enthusiasm about her field.” Helen Sawyer Hogg’s first weekly column appeared in the Star on January 13, beginning with a piece highlighting the career of her late husband, whose work had been primarily concerned with measuring the radial velocity, or speed, of stars. 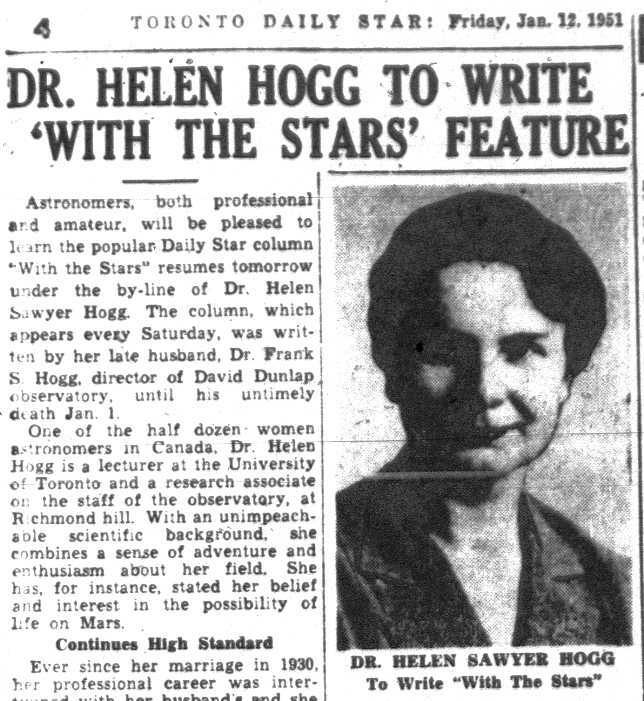 The Toronto Star‘s announcement that Helen Sawyer Hogg will take over the weekly astronomy column. The Toronto Star, January 12, 1951. Although not the original creator of the column, Sawyer Hogg soon made it her own, drawing on her experience as a popular, accessible lecturer. She also brought some experience as a less formal astronomy writer; since 1946 she had been writing an astronomy history column called “Out of Old Books” for the Journal of the Royal Astronomical Society of Canada, covering subjects such as Leonardo da Vinci, the magnetic research of Edward Sabine, and the 1769 Transit of Venus. Helen Sawyer Hogg. The Globe and Mail, April 20, 1964. Photo by Janine, CP. In addition to maintaining her position at the university and filing columns for the Star, Sawyer Hogg also accepted several other responsibilities. One summer was spent as a lecturer at Harvard. In 1955, she took a year’s leave to serve as the program director at the National Science Foundation in Washington, D.C. She served terms as president of numerous scientific organizations; when, in 1964, she became the first female president of the Royal Canadian Institute, the country’s premier scientific society, Sawyer Hogg promised to dedicate at least two days a week there. Later that same year, the Star reported that she was spending time working on the science and medicine exhibition at the upcoming Expo 67. Additional material from: C.A. Chant, “Frank Scott Hogg, 1904-1951” in Journal of the Royal Astronomical Society of Canada, Vol. 45, p.1-3; Christine Clement, “Helen Sawyer Hogg, 1905-1993” in The Journal of the American Association of Variable Star Observers, Vol. 22, No. 1 p.83-86; The Globe (November 11, 1946; January 2, 1950; January 2, 1951; October 4, 1952; April 20, 1964; May 20, 1976; November 1, 1984; January 30, 1993); Helen Sawyer Hogg, The Stars Belong to Everyone: How to Enjoy Astronomy (Doubleday, 1976: Toronto); Judith L. Pipher, “Helen Sawyer Hogg (1905-1993)” in Publications of the Astronomical Society of the Pacific, Vol. 105, No. 694 p.1369-1372; Benjamin F. Shearer & Barbara S. Shearer, ed., Notable Women in the Physical Sciences: A Biographical Dictionary (Greenwood Press, 1997: Westport, Connecticut); The Toronto Star (April 30, 1935; July 30, November 4, November 7, 1938; June 1, June 14, 1940; February 1, August 1, 1941; January 30, 1946; December 31, 1949; January 2, January 12, January 13, 1951; June 25, October 2, November 12, 1952; August 18, November 15, 1955; April 26, 1958; June 11 1960; April 20, 1964; July 2, 1966; May 23, 1967; October 26, 1968; July 26, 1969; August 2, 1976; January 10, 1981; June 4, 1984; November 24, 1985; January 29, February 7 1993); The Evening Telegram (January 2, 1951; April 20, 1964).